Let’s take a close look at the things I will plan, and the things I will improvise. 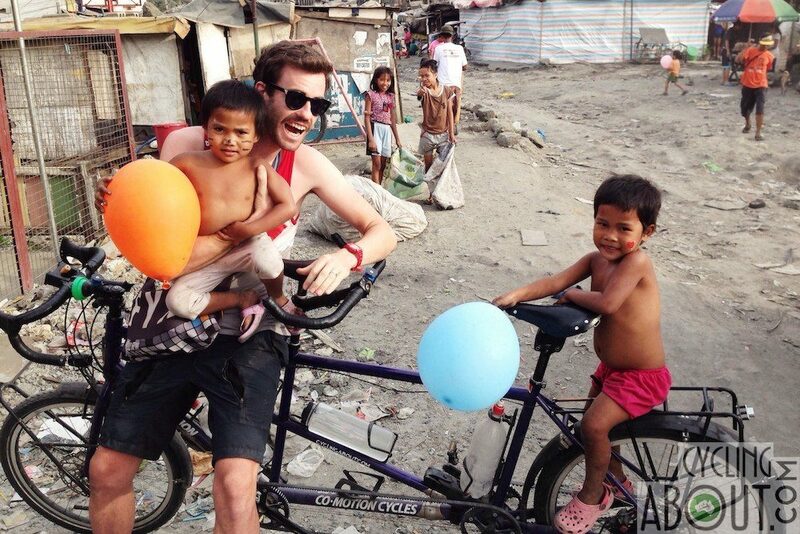 Hanging out with some friendly children in Manila, the Philippines. What I Want To See. I’m currently creating a map with dropped pins showing the national parks, mountain passes, towns, landscapes, monuments and people that I want to see in the Americas. These locations essentially dictate my route as I attempt to link everything up. Climates. 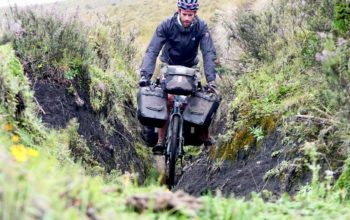 Weather planning is pretty important for most bike trips because there’s always an ideal temperature range and rainfall period. I try to link suitable climates together, avoiding weather extremes where possible. Head HERE for my detailed weather planning information and tools. Rough Dates. Sometimes visas will lock-in some dates for you, but I find that having target dates along the way, as well as a rough finish date will help me determine the pace of my journey. Cycle Routes with Limited Services. In remote areas I try to research what services are likely to be available. When I have an idea for the temperature ranges, water and food sources, elevation profiles, and general road quality it helps me to mentally prepare for that section. Flights. If I need to take flights during my trips, I try to organise them a few months in advance while they’re cheap (I’m not planning on taking any flights for the Americas, however). My Gear. 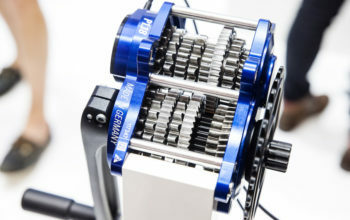 I’m a gear freak, so most of my trip planning is thinking about what to take (jokes… but serious). The reality is that you can’t really know what you’ll want (or use) until you’re actually out there and using it. 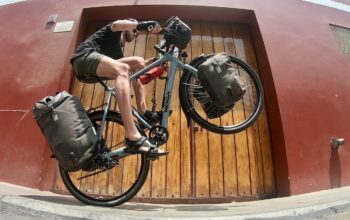 If you’re unprepared with your gear, it’s really not a problem; I’ve purchased gear along the way and even had packages delivered to me from all over the world. 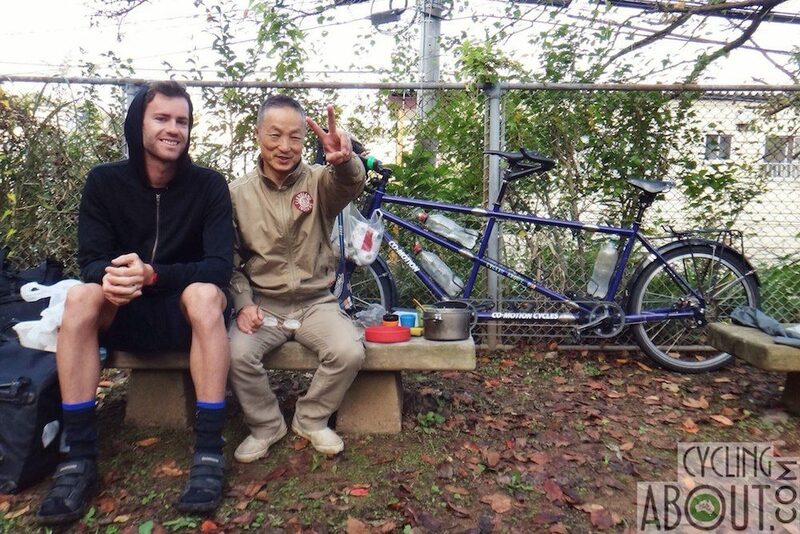 When I was wild camping in a park in Japan, I was greeted by this local who invited me into his house. Bike-Friendly Routes Into Cities. I normally spend a lot of time looking at Google Maps and Komoot to find a bike-friendly route into busy cities. Sometimes it doesn’t quite work out, but good preparation will often get me into a city centre completely stress-free. Breakfasts. The most important meal for me is breakfast. I eat rolled oats almost every morning, no matter where I am. To make it as nutritious as possible I try to mix through all kinds of nuts, seeds and dried fruit. The issue is that these ingredients are sometimes not available, so I therefore carry large supplies until I know I can restock! Head HERE for some of my porridge tips. Money. ATMs are not always commonplace, so do some research on where you can get your money out. Some banks will favour Mastercard over Visa (or vice versa) and sometimes they will have a cash limit. You’ll of course need to do some budgeting to work out how long your money will last until the next ATM. Visas. Sometimes it’s important to know where you can apply for visas, and how long the visa application process will take. For example, I knew it would take a while to get my Iranian visa, so I organised it two months in advance (it almost took that long too). 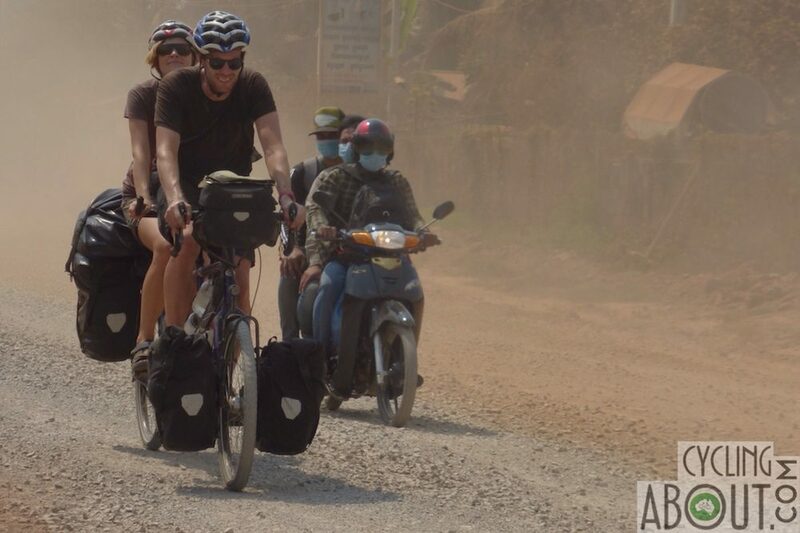 Cycling the super dusty roads of Cambodia. Distances. I normally plan 120-150km per day based on the terrain and services available (I’m rather fit/experienced). I then add in a handful of days just in case I meet someone, or want to explore somewhere further. 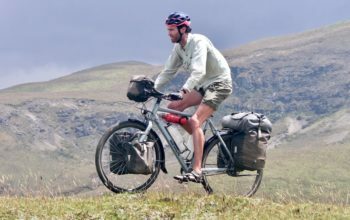 For example, when covering 1000km between point A and B, I would allocate eight days for the riding and perhaps 2-3 days just in case I feel the need to stop. Riding Hours. When the temperature is too hot during the middle of the day, I plan to get up around sunrise and finish before lunch. Conversely, when the temperature is cold overnight, I tend to be up later when the sun can keep me warm. Budget. I try to save more money than I think I will need so that I don’t have to ever stress about it. 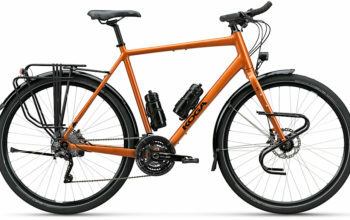 You’ll need to factor in a bit extra for additional purchases along the way (heck, I bought a tandem on my last RTW trip). Budget planning is important mostly so that you know how much cash to carry between ATMs. Route. Sometimes I go for minor roads, other times I go the most direct route if I’m short on time. 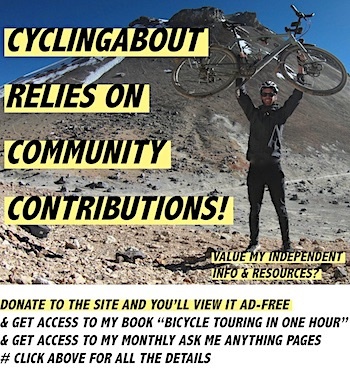 I normally check my route on MapOut or RideWithGPS to investigate whether the elevation profile will be suitable given my time constraints. I then note down towns or landmarks along the way which help me plan for food, water and accommodation. Sleeping in Cities. 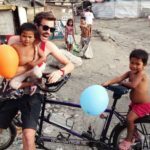 I book rooms (or organise a CouchSurfing/WarmShower host) in big cities to avoid riding in circles looking for a place to stay. Searching for a hotel can be a big waste of time if you are a price sensitive long-term traveller. 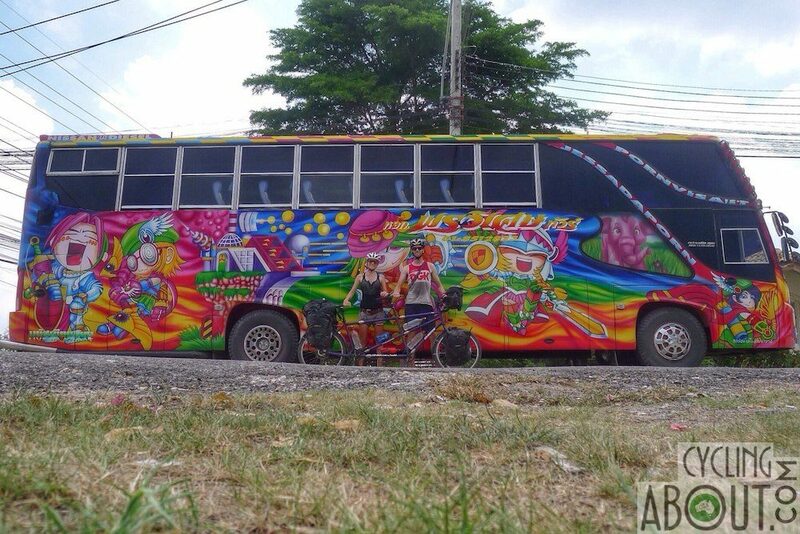 A crazy, colourful bus in Thailand. Sleeping. When I wake up in the morning, I almost never know where I’m going to sleep. This method is easy in some places and harder in others. If it’s a region where I know I can probably afford a hotel room, I either arrive without having a hotel in mind, or do a Google Map search for ‘hotel’ or ‘guesthouse’ and drop a few pins in my mapping apps. When hotels are out of my budget, I’ll wild camp by scouring my smartphone maps for large green areas. In many developed countries you will find really handy smartphone apps that list paid and unpaid campsites. And finally, in some countries with ultra-friendly locals I even ask if I can stay with them. Believe it or not, I rarely get turned down! Eating. In areas where restaurants are cheap, I tend to carry very little food. Otherwise, I like to stock up in supermarkets with 1-2 days worth of food at a time. Water. I generally ride until I’ve got 25-50% of our water left, then look out for a water source. Taps are found almost anywhere you find people. Do You Plan Your Trips In A Similar Way? 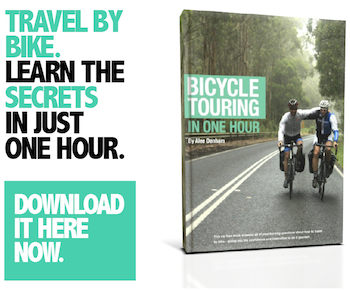 Have You Got Any Other Trip Planning Tips?